Now you can practice your driving skills in a parking lot or on a race track! Drive a big bad off-road jeep and get to the checkpoints as fast as possible! Hope you on your mini-moto and test your skills against the best on the circuit! This is the second episode in the fun Foofa Race series! Welcome to Girl Games, the largest free game site made just for girl gamers! This is the place to play free Action games in popular categories such as Platformers games,	Driving games,	Shooting games,	Base Defense games,	Misc Action games,	Arcade and Classics games,	Mouse games	and more! and much more! You'll always find the cool games at Girl Games, we have all the best games from game developers like i-dressup, girlsgogames and cartoon doll emporium so you will never get bored! 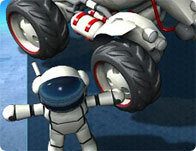 This month we have some amazing games like Nuclear Bike	, Foofa Race 2	and Mini Moto. New games are added every Thursday, so check back for all the latest free games online!